If your tribe is expanding this is the category that could easily fit the bill. THE FUN thing about Wheels Car of the Year is that you line up 22 cars and then 21 of them lose. This, in turn, means that almost all of our readers will disagree with the final choice. Every year in the wash-up from COTY, we learn that we have lost all credibility, are liberal milquetoasts and have our heads lodged in our fundaments. But 2017 was different. 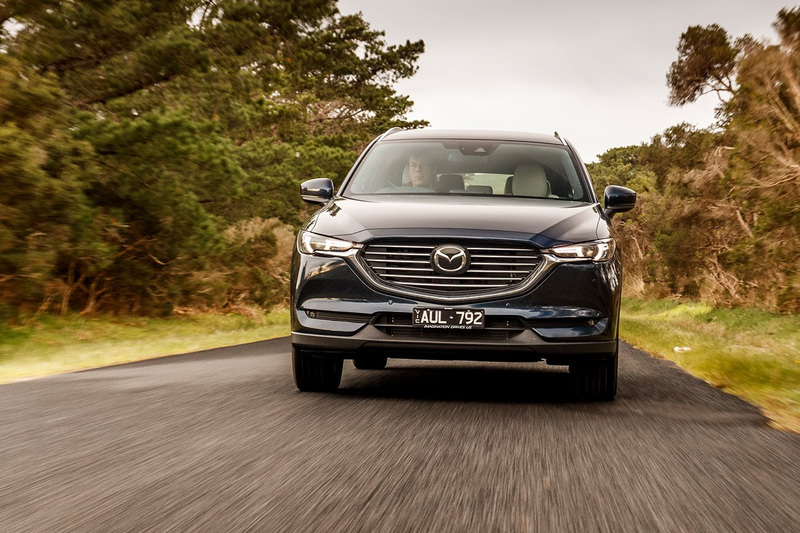 We were expecting the usual online shellacking after giving the award to an SUV for the first time in more than a decade but, by and large, readers just shrugged and acknowledged that the Mazda CX-9 was a worthy winner. We all sat glumly over our soy lattes and wondered where we’d gone wrong. The thing is, there always was a chink in the CX-9’s armour. It feels vast and while its 170kW turbocharged petrol engine is reassuringly overspecified, it also drinks a bit; qualities which, when combined, don’t make it the most universally endearing urban wagon. When Mazda announced the slightly slimmer, 2.2-litre diesel-powered CX-8, it seemed the answer to many customers’ prayers and spawned this comparison of seven-seat up-spec oil-squashers. The model in question here is the 140kW/450Nm Asaki range-topper, priced at $61,490. Available options for this version run to just floor mats and premium paint. The CX-8 might have been the catalyst, but it isn’t the only new face here. 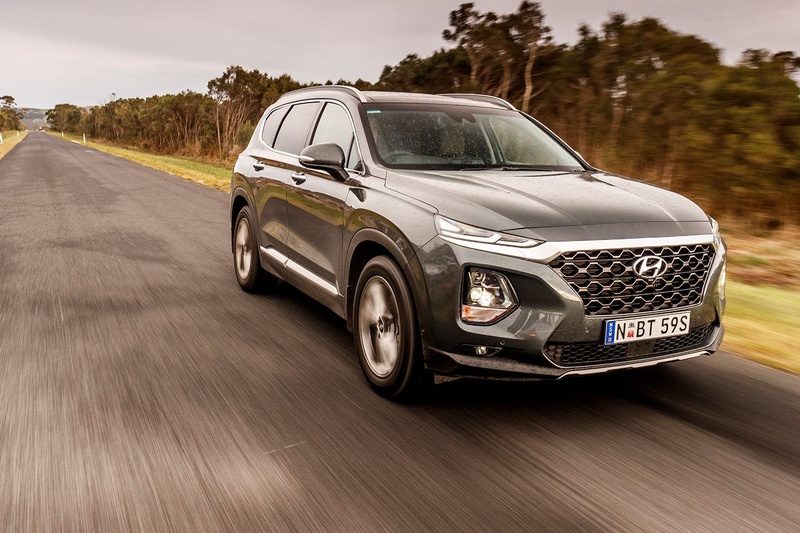 Hyundai’s fourth-generation Santa Fe also wings in, bringing greater interior sophistication while ditching the old model’s clean but anonymous lines for something with a bit more presence. Think of it as a more grown-up take on the Kona’s conspicuous and extrovert design theme, carrying over the old but well regarded 2.2-litre 147kW/440Nm transversely mounted diesel that’s now mated to an eight-speed automatic transmission. The range-topping Highlander specification, priced at $60,500, squares up nicely to the Japanese newcomer. 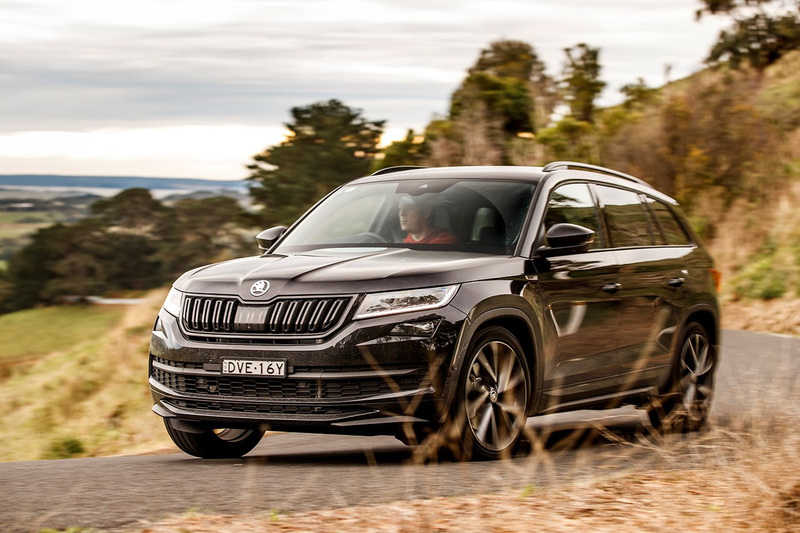 Providing a durable benchmark of excellence in this sector is Skoda’s Kodiaq. The petrol version almost carried off our COTY award this year and the diesel-engined version could well prove an even more tempting proposition. This Sportline version looks a bargain at $52,990 before you have any issues with impulse control when confronted with an options list. This particular example of the 140kW/400Nm 2.0-litre Czech came loaded with pearl-effect paint as well as Tech and Luxury packs, lifting the price-as-tested to a not insignificant $59,690. The petrol version of Peugeot’s 5008 came up a little short when we last gave it a Skoda Kodiaq to chew on back in April of this year, but it gets a second chance to impress in diesel form. The 2.0-litre diesel engine only drives the front wheels but the Pug is both light and squeezes a lot out of its powerplant, making the same 400Nm as the Kodiaq, while its peak power output of 133kW gives it a superior power-to-weight ratio. City-friendly dimensions and a focus on driving dynamics also offer something a little different to the usual adipose image of seven-seat SUVs. The diesel engine is solely offered in style-driven top-spec GT guise, priced from $54,490, but supplied here with Amazonite Grey paintwork and a $4K pack that includes heated Nappa leather seats and a panoramic roof. As is usual with Wheels comparisons, we’ve thrown in a left-fielder to keep the others on their toes. Land Rover’s Discovery Sport isn’t traditionally thought of as a seven-seat hauler, but a pair of additional seats can be optioned into one. 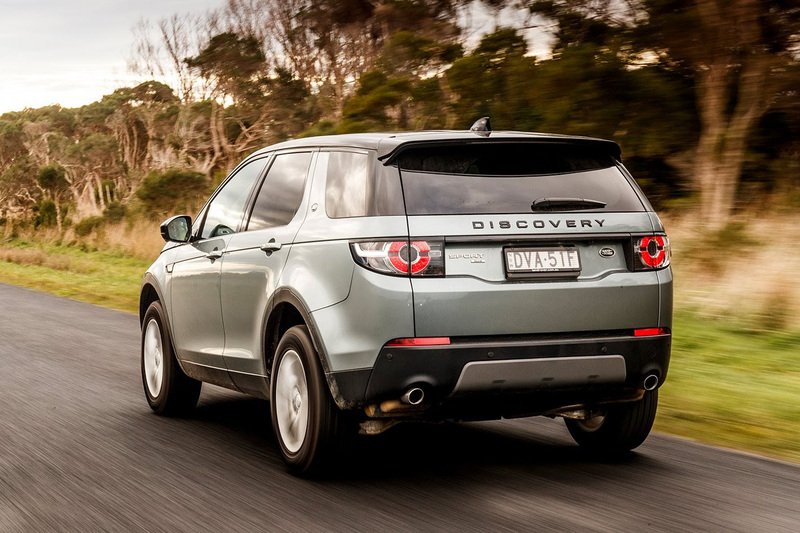 The obvious rival for the aforementioned quartet would probably be the $60,290 TD4 132 SE but Land Rover Australia didn’t have one available on fleet, so we had to compromise slightly and step up to the more powerful 177kW SD4 engine which wears a $66,455 sticker. Add $3470 for the extra row of seats and you’re good to go. Or you would be if Land Rover hadn’t upturned another $16K worth of goodies inside, which we’ve been striving studiously to ignore. Speaking of oversights, is it me or does the Mazda CX-8 look a bit anonymous? Okay, so the doom blue paintwork probably isn’t doing it any favours, but from some angles it looks curiously underwheeled and there’s an unsettling unorthodoxy to its proportioning. Designed for the Japanese market, which doesn’t get the chunky CX-9, the diesel-only CX-8 is otherwise only sold in Australia and New Zealand. Its wheelbase of 2930mm is shared with the CX-9, as are some of the suspension parts, but it utilises the smaller CX-5’s body width of 1840mm. Front and rear track widths are separated by only a few millimetres compared with CX-5, while inside, virtually everything forward of the B-pillar is common. The Kodiaq is 2.49 times as long as it is wide, the 5008 2.51x and the Santa Fe’s ratio is 2.52x, so all conform to a closely templated ‘footprint’ in the class. The CX-8’s ratio is 2.66x which, combined with its modest 200mm ground clearance, results in a form factor more akin to an MPV than an SUV. The Santa Fe only affords you 185mm of fresh air beneath its belly, so its all-wheel-drive abilities are best reserved for gravel roads and wet bitumen rather than anything much more involving. The squinting LED strip headlight, huge grille and auxiliary light cluster inset into a stealth-like fusion of non-orthogonal shapes gives the big Hyundai real presence. The flanks are more conventional, with a sharply rising waistline, while the rear end features the same vestigial bumper-level light pods as seen on the Kona. 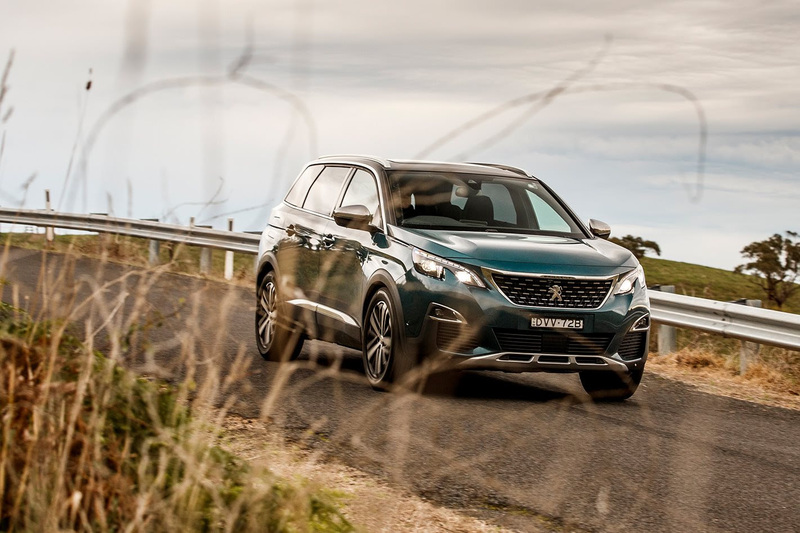 The 5008 and Discovery Sport are by now fairly familiar and the Kodiaq is a regular sight on Aussie roads, although this Sportline model, finished in black with standard Vega anthracite 20-inch alloys made, by common consent, the most cohesive styling statement. The Kodiaq also convinces on road. Everything we loved about the petrol version’s dynamics are preserved in this diesel with the added benefit of more power and torque. We recorded a 9.5-second sprint to 100km/h, matching the powerhouse Land Rover in the process for the joint quickest time. From 100, however, the Kodiaq just drove away from the Discovery at the strip, its lightning-quick dual-clutch transmission, superior aerodynamics and more efficient driveline seeing it more than a second clear of the Disco by 160km/h. 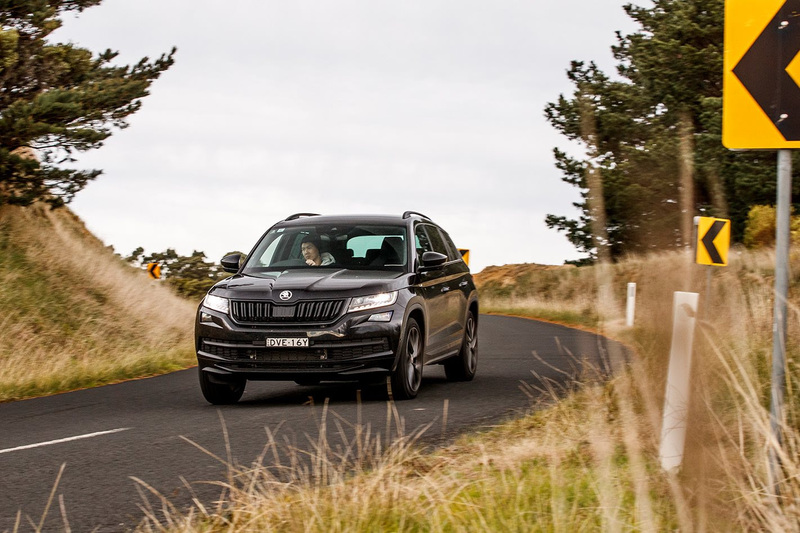 Testers were impressed by the Skoda’s body control on our test routes, while considering that this car’s $2600 Tech Pack also brings Adaptive Chassis Control with three electronically regulated damper settings: Comfort, Normal and Sport. Ride quality, even in Comfort, is on the firm side and wind noise comfortably the loudest of the lot, but the Kodiaq’s front end is so responsive that you find yourself driving it like an upscaled all-wheel-drive hot hatch. That said, you’d have difficulty shaking a Peugeot 5008 on the twisty way home from the school run. Tipping the scales at just 1575kg thanks to its gossamer EMP2 chassis – less than some Porsche 911s – the 5008 features the best power-to-weight ratio of anything here without a Land Rover badge, and had our Discovery been fitted with the more suitable 132 TSI engine, it would have topped the lot. 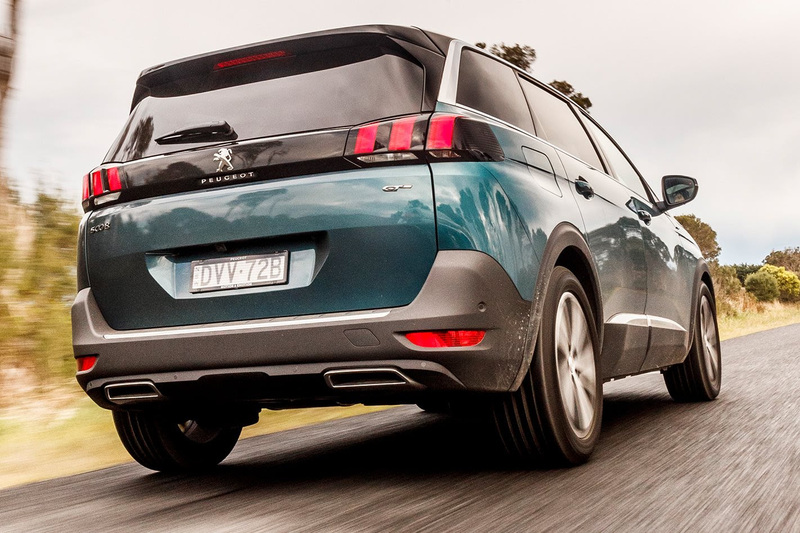 We bettered Peugeot’s claimed 0-100km/h time of 10.2 seconds by a chunky seven-tenths and loved the 5008’s wieldy slottability along both urban streets and country lanes. The sport mode adds some welcome attitude to the soundtrack, artificially drowning out its rather sibilant engine, although it does introduce an unwelcome propensity to hang onto gears for a fraction too long. The 5008 GT feels taut, poised and generous in its feedback, and might have made the Santa Fe feel like a lumpen clod. That’s what we expected, at least. The reality is that the Hyundai’s a real eye-opener, carrying speed effortlessly across country. It’s necessary to manage that 1995kg kerb weight at times, but the Santa Fe delivers meaty and talkative rack-mounted electric steering, decent pitch and roll control and strong stoppers, registering the best braking performance on track, even pulling up more sharply than the featherweight Peugeot. Like the French car, it rode on excellent Continental ContiSportContact 5 rubber, albeit with a slightly more generous sidewall. The subjective feel of the brake pedal can seem a bit flabby with the car switched into Sport mode, which sharpens the throttle mapping to such an extent that the brake pedal feels long by comparison. 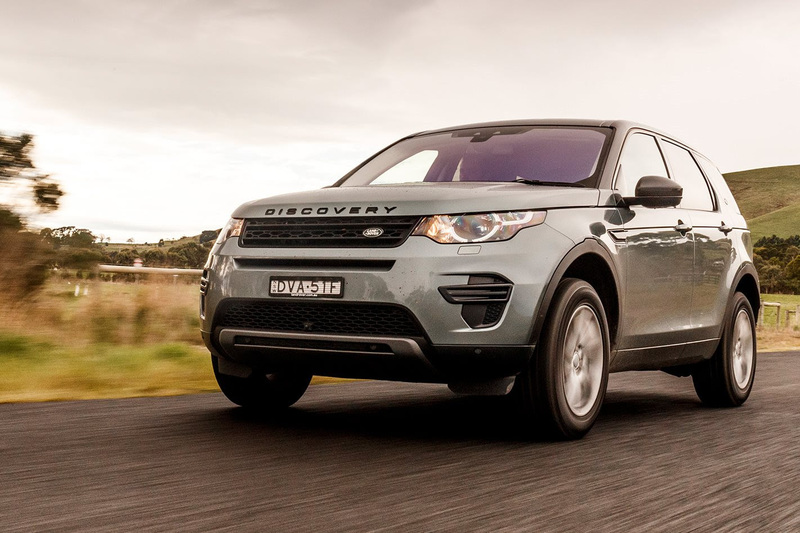 The Discovery Sport felt a few degrees vaguer in its responses, the car porpoising and grabbing at the stability control when harried through bumpy corners. Any gripes about the Land Rover’s handling in extremis on bitumen has to be tempered by off-road chops that are vastly superior to anything else here. Judged in that context, its ride and handling are better than they have any real right to be. The engine never quite feels its big kilowatt advantage and there’s a fair degree of old-school head toss on so-so surfaces. Driven at something less than eight-tenths it can feel beautifully relaxed, the nine-speed transmission slurring through changes with real sophistication. Like the Discovery Sport, the CX-8 isn’t a car that encourages you to give it a good workout, despite its promisingly low driver’s hip point. There’s that nagging suspicion that you’re getting the aloofness of the CX-9’s turn-in but missing out on the COTY winner’s imperious ride quality. What it lacks through corners, the Mazda makes up with a beautifully calibrated drivetrain and easily the best refinement here. Dial things back a little and it all makes sense, the CX-8 encouraging this by eschewing fixtures such as shift paddles or selectable drive modes. There’s a languid long-wheelbase sang-froid to its comportment that’s wholly pragmatic, if a little disappointing from a company that can usually be relied upon to deliver a broad and satisfying dynamic repertoire. There are no complaints about the CX-8’s practicality, though. It features comfortably the longest passenger cell of this group, and is the only one where you’d countenance putting adults in the third row. Or kids under seven come to that, as it’s alone in providing top tethers built into its third row. Egress from the third row is also the best of this bunch; an often overlooked safety consideration. The cabin is wholly unadventurous in its execution if you’re familiar with Mazda’s current design language, but it all feels well finished and practically executed. The small centre screen feels a bit behind the curve, but the CX-8 gets a head-up display to complement the analogue clocks. Headroom is excellent throughout, with a massive 9cm more driver’s headroom than the pinched Peugeot (104cm vs 95cm) although much of this disparity comes about due to the French vehicle’s accursed optional panoramic sunroof. 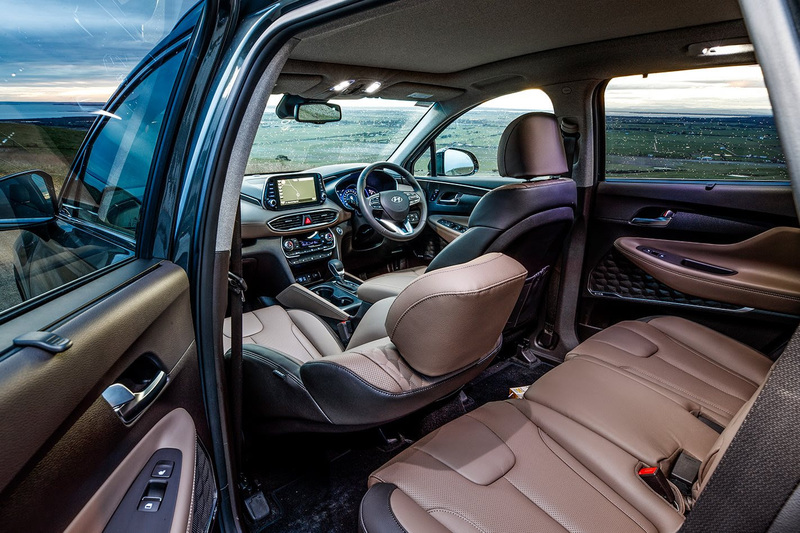 The Santa Fe requires a little more flexibility to clamber into the third row and while space there isn’t too bad, the view out is poor for small kids, the rising window line offering a lofty porthole to peep out of. Hyundai claims that this aperture is 41 percent bigger than that of its predecessor. It still feels poky back there. The story’s a lot happier up front with stacks of standard equipment in this Highlander flagship, including wireless mobile charging, a heated steering wheel, a gutsy Infinity stereo, heated and cooled seats, a massive panoramic glass roof, a head-up display, and a surround-view parking monitor, at which point you get the idea. We expect this from Hyundai. 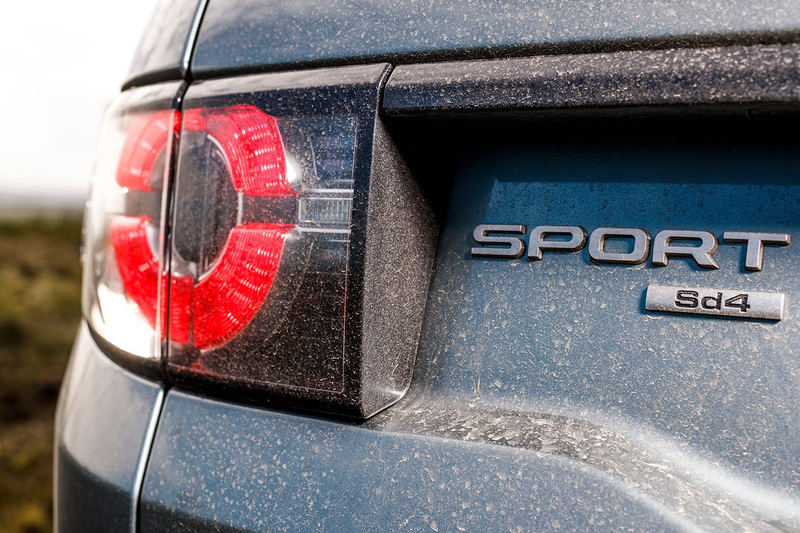 We haven’t always expected a car that’s rewarding to drive as well. The Skoda probably marks the limit of acceptability for a seven seater where the rearmost seats will get used on a semi-regular basis. It makes the most of the real estate afforded by its modest 2791mm wheelbase, with the most second-row headroom and plenty of available legroom thanks to the generous travel of the sliding 60:40 rear bench. The Sportline trim brings a carbonfibre effect to the fascia panels that sounds utterly egregious in a family SUV but which complements the finish of the perforated leather wheel and deeply bolstered Alcantara-trimmed front seats. The usual Skoda thoughtfulness is evident, with unique door-edge protectors, a sensible division of physical buttons and on-screen menu items, surprise-and-delight blankets, umbrellas and twin glove boxes. The 5008 is a mixed bag. Judged purely on its interior aesthetic, it’s a winner. Practicality? Not so much. So many of its control systems seem to prioritise style over functionality, the sunroof that most buyers specify crucifies available headroom and the removable rearmost seats are perfunctory at best, hidden beneath a mess of folding flaps. 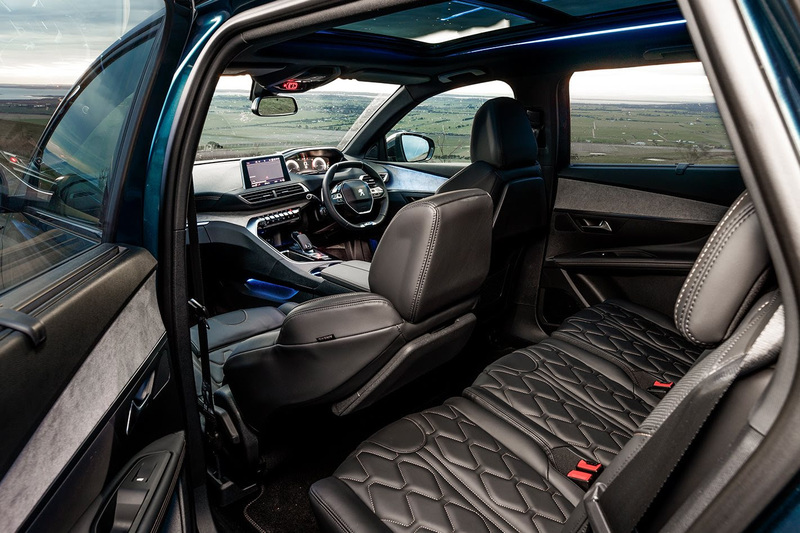 The Discovery is even worse for third-row occupants, its pair of chairs offering a mean 85cm of headroom, little view out, footspace crippled by huge plastic floor-mounted cupholders and terrible access to the rear doors. Why you’d put anyone you had any regard for in these seats frankly boggles the mind. The practical shortcomings of the British and French vehicles help decide this test. The Land Rover brings up the rear. It has to. It’s expensive, cramped and, in certain regards, it feels very old with its incandescent globe headlamps, CD slot in the dash, non-adaptive cruise control and variable finish of dash materials. 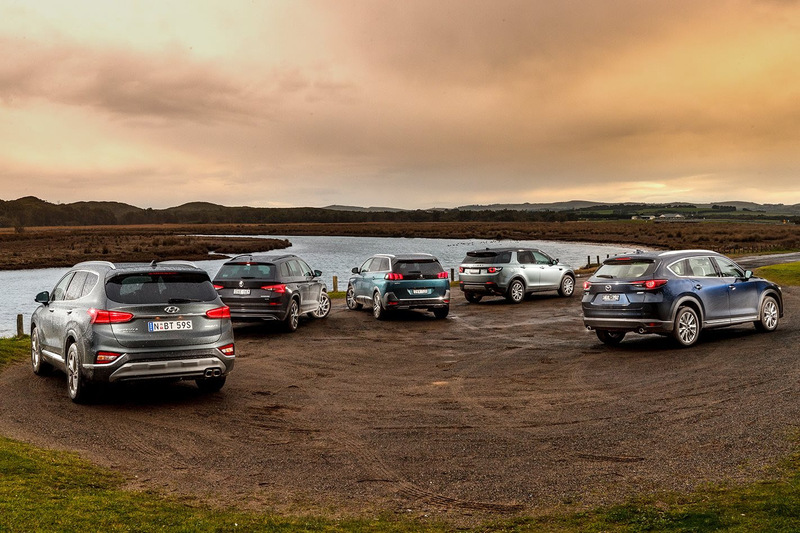 The exterior styling has aged very well – the Discovery Sport still looking sharp and elegant – and its off-road credentials still make the Sport a worthy purchase, but it’s a heavily compromised seven-seat pretender. The 5008 is an interesting one. We can certainly see how it might appeal to those who want something manageably sized, stylish, economical and fun to drive. The thing is, many of these qualities diminish its usefulness as genuinely practical transport for larger families. Interior space is compromised by the optional overhead glazing, which you should avoid if you’re anywhere near six foot, but even aside from that, you’re not getting the benefits of all-wheel drive and there’s the nagging suspicion that you’re buying less all-weather ability, less towing capacity and less useable luggage space; in effect paying the same for a vehicle that’s half a class behind the best three cars here. Separating the Mazda, Skoda and Hyundai isn’t easy, partly because they’re three very different means to much the same end. It’s most instructive to think of them as a continuum. At one extreme, representing comfort, practicality and discreet commonsense is the Mazda CX-8 Asaki, while the Kodiaq Sportline is at the other end, delivering a sharp steer, slick styling and acceptable compromises for third-row occupants. 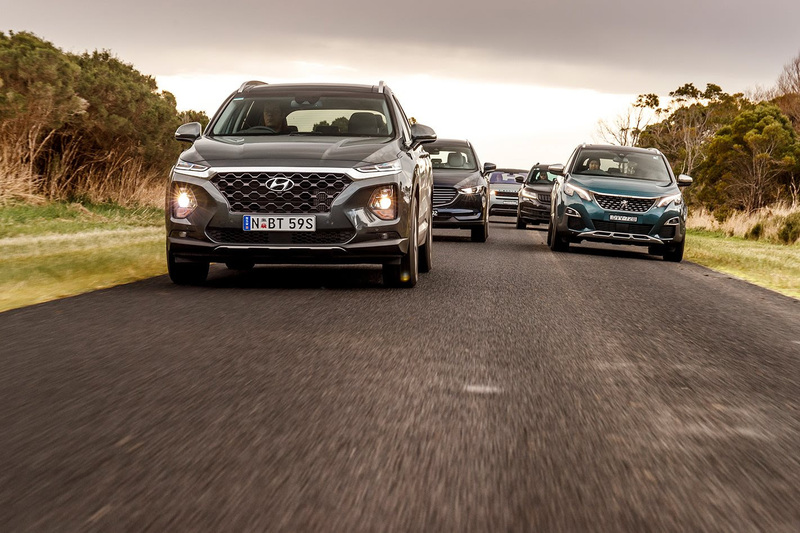 Somewhere between the two is the Hyundai Santa Fe Highlander, which is composed and punchy enough to entertain on a good road while delivering plenty of space and equipment. On that basis, it just does enough to squeak a win. We expected something big but vanilla from Hyundai, but the Santa Fe is a far more nuanced proposition. Whether it would top the podium had Mazda merely plumbed a diesel engine into the CX-9 is another question altogether. Still, it’ll be interesting to see how deep the Hyundai will go at the next COTY. You’ll still get pretty good odds on a maiden win for South Korea.